Yes on CA Prop 12! Please spread the word to vote Yes on 12 to protect millions of farm animals in California. And if you live in California, be sure to vite for the animals on Tuesday! Two major announcements regarding farm animal welfare provide some measure of celebration for animals in these trying times. First, in Ohio, activists have been working to get a proposition on the ballot, much like those successfully run in Arizona and California. 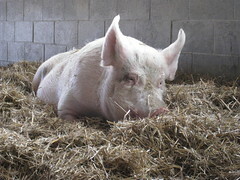 Instead of proceeding with the ballot initiative, Ohioans for Humane Farms (supported by the Farm Sanctuary, the Humane Society of the United States, and other animal advocacy groups) agreed to drop their campaign if the state’s agricultural industry agreed to several reforms, including a ban on veal crates, a ban on gestation crates, and other measures (which are outlined in this Farm Sanctuary press release). come from hens able to stand up, fully extend their limbs, lie down and spread their wings without touching each other or the sides of their enclosure, thus requiring cage-free conditions for the birds. Otherwise, laying hens are kept in cruel battery cages. Imagine if you had so sit on a metal folding chair your whole life – you can’t move, you can’t stand, you can’t stretch. That’s what a battery cage is like. Kudos to Schwarzenegger for signing the bill into law. Click on the image below to learn more about this sure-to-be-spectacular event. One of my sterling silver chain maille bracelets will be in the silent auction. I wish I could go, but I have to teach early Friday morning. I received this message on the UFETA listserv. It was also posted on the Vegan Etsy blog. I hope all who can will donate to Peaceful Prairie to help them expand their operation and keep the acerage near them cruelty free. We have an incredible opportunity to expand the sanctuary by 35 acres and to acquire a 4000 square foot home that will be converted into an Education Center and volunteer / intern housing and B&B for sanctuary visitors. This kind of capital improvement to the sanctuary is 10 years overdue — but we now have the opportunity to purchase the property for $100,000.00. Thanks to one VERY generous benefactor, we’ve already raised $70,000.00!!! We need to raise the other $30,000.00 before the end of the week in order to make a cash offer on the property. Another family has placed an offer and, due to the Agricultural zoning, they will have to use the land to enslave and exploit animals. Please help us stop it before it starts, while simultaneously expanding the sanctuary and our ability to care for and advocate for countless more victims of the egg, dairy, flesh producers and consumers. Time is of the essence – if you are able to contribute to this, please let me know right away. To donate, please visit their site or go here. As you know, Farm Sanctuary has fought factory farming cruelty for more than 20 years. But right now, with your help, we have the greatest chance in history to effect change on factory farms – so I’m asking for your immediate action. Proposition 2, on the ballot in California, would outlaw the most painful, horrendous confinement systems that we have been fighting all along – gestation crates for pregnant pigs, battery cages for egg-laying hens and veal crates for calves. But we must raise $250,000 by this Thursday, Oct. 23, at noon to air our TV ads that will educate voters before the election. Farm Sanctuary has invested its staff and its advocacy budget in this campaign. And today I am asking you to make a gift directly to the YES! on Prop 2 campaign. In just 15 days, California voters will have the chance to say “YES on Prop 2” and help relieve the suffering of 20 million animals. The passage of this legislation will send shockwaves through the nation – showing consumers, industry leaders, the media, politicians… everyone… that these systems are cruel and must be outlawed. It will spur change across the country, and lead to more reform at every level. The benefits of victory are immeasurable. The future of farm animals in the U.S. is hinging on this battle… and the animals are counting on us. When Farm Sanctuary first began documenting factory farming cruelty in the U.S. in 1986, most people hadn’t heard of a “gestation crate” or a “battery cage.” But, we went in and took pictures, videos … and we rescued animals … who had languished day after day, year after year, in these cages. This is the “system” of factory farming that has taken over America’s farms. Millions of animals face this exact misery … and they need help. Please make a special gift today directly to the YES! on Prop 2 campaign. Farm Sanctuary has set out to bring the gross abuses of factory farming to the forefront in the media and STOP them. We fight – and win – many hard battles for farm animals, including passing the first laws in the U.S. to ban cruel factory farming practices. And we can win this latest fight, but we truly can’t do it without you. We can’t afford not to win. The animals can’t afford to lose. We must rally every resource and fight Prop 2 opposition head to head. We have broad support. But the opposition’s resources are vast. They are investing millions in misleading ads to dissuade voters from supporting Prop 2. We will be fighting up until Election Day and need every dollar to air as many ads as possible in the limited time left. In order to win, we need every Farm Sanctuary member to join in this fight. We need you to make this commitment. Please, send your emergency donation to the YES! on Prop 2 campaign right now to put television ads on the air. And, forward this email encourage others to join this campaign and urge Californians to vote YES! on Prop 2. By making a gift today, you can make history. You can bring an end to the most egregious, unacceptable practices in the factory farming industry. On behalf of the pigs, cattle and chickens at Farm Sanctuary, who have lived through the horrors of factory farms, we thank you for taking action and making a difference for all farm animals.